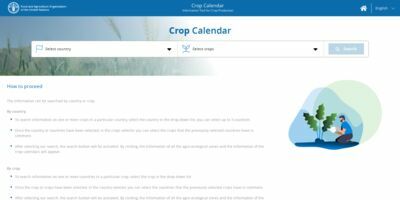 The Crop Calendar is a tool that provides timely information about seeds to promote local crop production. It contains information on planting, sowing and harvesting periods of locally adapted crops in specific agro-ecological zones. It also provides information on the sowing rates of seed and planting material and the main agricultural practices. This tool supports farmers and agriculture extentionists across the world in taking appropriate decisions on crops and their sowing period, respecting the agro-ecological dimension. It also provides a solid base for emergency planning of the rehabilitation of farming systems after disasters. The Crop Calendar provides information for more that 130 crops, located in 283 agro-ecological zones of 44 countries.